When you think of murals, what do you think of? Street artists sat on the sea front drawing seascapes and seagulls? Or, Creative graffiti artists, sketching colourful creations onto walls, along the length of London’s Brick Lane? Or do you think of something different? Does advertising and marketing spring to mind? Maybe not at first, but boy; can wall murals be an effective way of selling pretty much anything. If you want maximum reach and maximum impact; then you really can’t go wrong. So much so, they you can bet your bottom dollar that you’ve seen these hand-painted advertising campaigns more often than you think! Brands have been using wall art for decades – maybe even longer – to promote their products and services. In fact; you only have to look closely at city centre walls to see faded murals promoting everything from liquor and soft drinks to cigarettes and coffee. It’s simple enough; the album artwork simply recreated on a huge scale. But that really is all that’s needed. 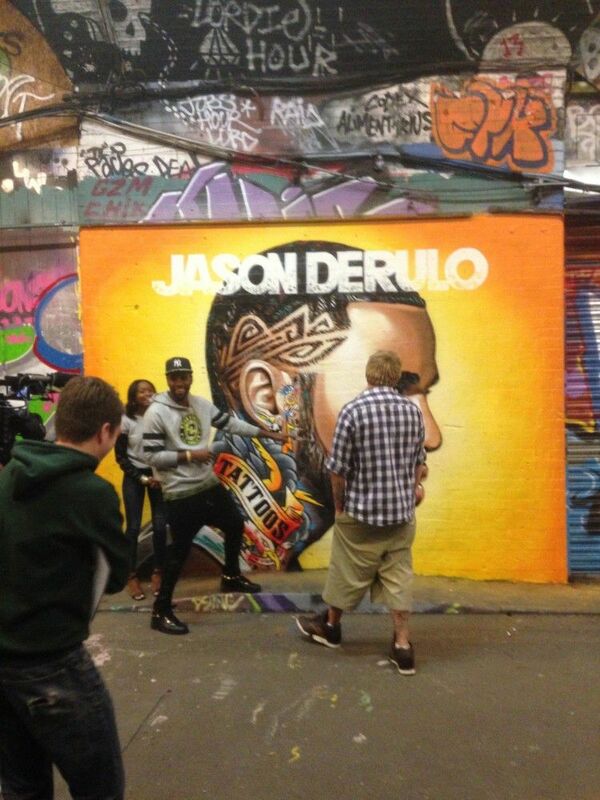 A colourful, eye-catching piece of street art that gets the message across and sells the album without a word. In a flash, we’d created a simple advert for the musician that his fans are instantly going to be drawn to; serving as a reminder to snap up their copy. Even those who’ve no idea who Derulo is, are introduced to his album and – the idea is – intrigued enough to head online and take a listen. And that’s what makes this kind of advertising so effective. Wall murals have moved from a form of graffiti art and expression, to a viable form of business advertising. 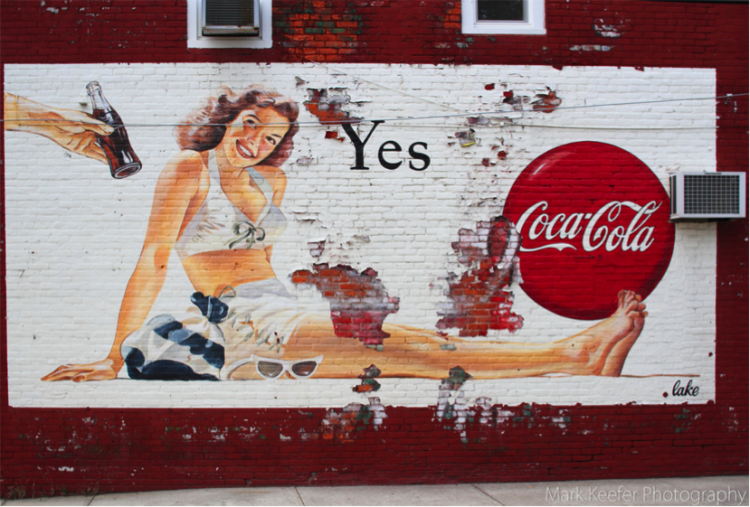 Whether it’s brands like Coca-Cola simply leaving their mark on walls (like in the example above), or Nickelodeon promoting a television series; wall art is leading the way in the graffiti for advertising revolution. And that’s why, hand-painted wall murals are fast becoming the go-to advertising method for movie release marketing. Film release marketing is a pretty lucrative – not to mention competitive – industry. Unless you’re working for one of the big Hollywood producers (with a budget to match! ), chances are that getting your film out there is going to a hard slog for everyone involved. After all, unless you can afford to advertise your film in front of millions during Saturday night primetime TV; you’re pretty much doomed to failure right? Sure, an action-packed trailer that jumps out of the TV screen and into your living room is one way to get noticed. But it’s not the only way. Movie release marketing has changed considerably over the years, and marketers are looking at creative ways to promote their films. Cost effective marketing methods that don’t scrimp on the impact aren’t easy to come by and marketers, advertisers and promoters are trying to strike the perfect balance. After all; audiences are becoming desensitised by the ‘in your face’ campaigns that have been en vogue for the last few years. And that is, perhaps, why hand painted murals – adorning brick walls and street corners – are fast becoming one of the most impactful, interactive and engaging ways of promoting a new film release. Whether it’s a Hollywood blockbuster or a low-budget indie flick; advertisers are turning to this new method to build a buzz around new releases. Why are Producers Turning to Murals and Graffiti Art? Penetrating the psyche of hundreds of people as they go about their daily business is no mean feat; especially given that we’ve all got our eyes glued to our iPhones! But by painting a humongous, colourful film poster on a city brick wall, you can be sure to attract more than a few double glances. In terms of film release marketing, wall murals are something to consider. Han painted wall murals have always been a huge success in the United States but now U.K marketers are finally coming round to their effectiveness too. Whether it’s a romantic comedy, sci-fi thriller, or colourful cartoon, graffiti artists can bring a movie to life...right on the streets of towns and cities all over the world. In terms of modern marketing, there really is nothing like going back to our roots. They’re impactful – The last thing you expect to see when you turn the corner to the office is a 100 foot Batman, staring down at you and watching over the city. Compare that to a standard billboard poster; which are you most likely to look at again? They’re memorable – The day after seeing a wall mural, television advert, and a poster printed in your newspaper, which are you most likely to remember? More importantly, which are you most likely to tell your friends about or take a photo on your smart phone and share online? Film advertising thrives on word-of-mouth, and creative campaigns like wall art are much more likely to get peoples’ tongues wagging. There are no rules – As long as you have permission to pitch (or paint!) your giant poster, the rulebook is thrown out of the window. You can create any kind of advert you like. You can get straight to the point with a traditional poster, or you can pique people’s curiosity with a more mysterious piece of artwork. They build a buzz – Want to promote your film release simultaneously across the country? How about the world? With a lot of planning, patience and perseverance, film promoters and marketers can create a huge buzz around a film release with an almost viral campaign that springs up seemingly overnight. They set your film apart from the competition – You only have to glance at your local cinema listings to see that plenty of films are released each week. And even if you have the most imaginative plot in the world, it can be a challenge to get those bums on seats. If you want to set the Box Office alight, you’ve got to do something special. Graffiti advertising certainly fits that bill. The painting of the murals is a marketing campaign and advert in itself- Watching a talented graffiti artist paint a phenomenal wall mural using spray paint is mesmerising and can itself be turned into a social media campaign through engagement, interaction and prizes. 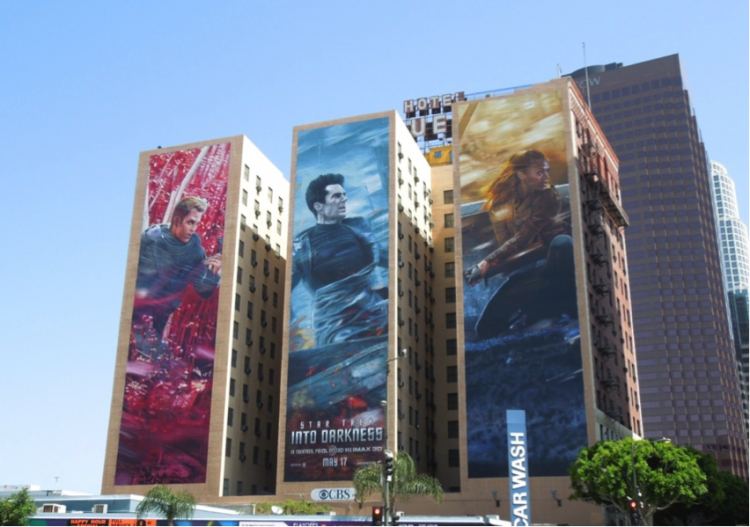 Hand-painted murals are effective film release marketing because they’re unexpected. Movie fans are so accustomed to seeing traditional forms of film advertising, that an impressive piece of graffiti art really does make them stop and think. Even if the art is promoting a film you wouldn’t otherwise go and see; you have to admit that seeing a giant piece of wall art is enough to entice you to head to the cinema!? This mural promoting Leonardo Di-Caprio flick Inception is completely jaw-dropping. It takes up the whole of this building block, and really would make you stop in your tracks. Imagine rounding the corner and seeing this! You’d think water really was pouring out of all the windows! And what makes it an even more amazing example of film release advertising is it doesn’t rely on the Hollywood front man to promote the film. Traditional billboards play on the cast to bet bums on seats; murals like this simply use graphic images to lure us in. Couple this with the mysterious “The Dream Is Real” tagline and you can bet that people will have been desperate to find out what this film is all about. This example shows just how creative film marketing is becoming, and how creative you can be. It also demonstrates that – in this case at least – the sky quite literally is the limit! Our second example comes from sci-fi sequel Star Trek: Into Darkness. This time, three buildings are used to make up the colourful mural and each features a key colour to catch the attention of passers-by. This time, the characters to play a more prominent role in the mural but the cartoon-like graffiti art adds a more surreal element. Limited text is used here – just the film name and release date – to let the drawing do all the talking. If you’ve seen the first film, you’ll know instantly what the advert is for. If you haven’t, you can take an educated guess as the drawing style is typical of sci-fi flicks and the Star Trek franchise. 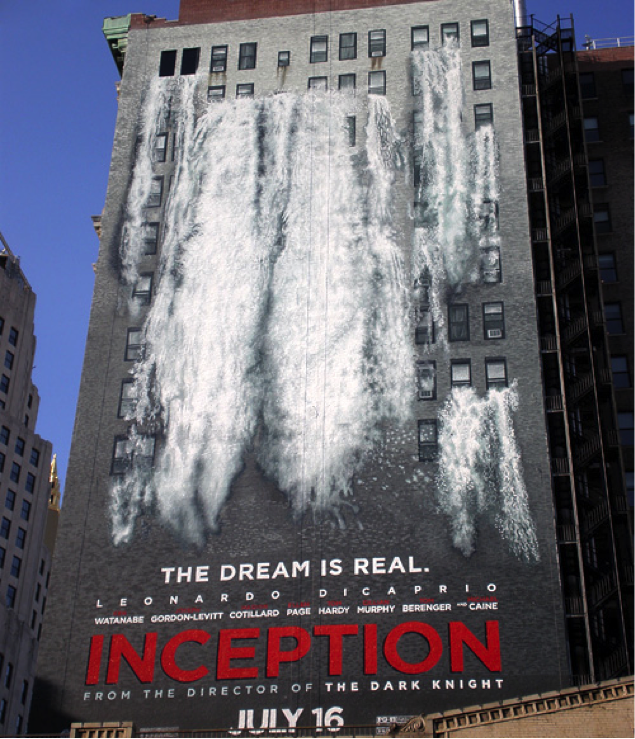 This example contrasts with the Inception one as it is focused less on the shock factor and more on promoting the film. Even so, you would most definitely do a double take walking past either of these buildings on your commute to work! Whether you have a film launch to promote or not, wall murals are a great way to get your message to the masses. At Street Advertising Services, we’ve worked with a whole host of brands and businesses in the creation of striking graffiti wall art. Our team of expert graffiti artists are some of the most skilled in the country, and are quite literally bursting at the seams with creative flair and ideas. Wall mural advertising isn’t currently a huge trend here in the UK, least of all when it comes to film release advertising. American skyscrapers are regularly adorned with advertising of this kind. Over here though, this marketing method still has the ‘wow’ factor. Us Brits just don’t expect to see marketing of this kind. If it’s impact you’re looking for then, wall murals really are an advertising technique to seriously consider. Especially if you want to stand out from the competition and give your customers something to talk about! No matter what you’re promoting, hand-painted wall murals are one of the best ways of getting your message across. They can be funny, emotive, controversial or just jaw-droppingly amazing. Whatever your marketing campaign and message, we can work with you to create striking wall murals that get the biggest bang for your marketing buck. Take a look at our online graffiti gallery to see some of examples of our work. You can also see some videos of our graffiti artists at work here. To find out more about how your business can use wall murals – whether you’re looking to promote a film, product or just your company – and to see what else Street Advertising Services can do for you, contact us today.